The Garden 2015 « I Don't Fear The Chaos! Hey there readers! Well… I say ‘readers’ and mean those few people still here and that one goat (Simon) that wondered over from Daf’s page! Anyway, back on track! 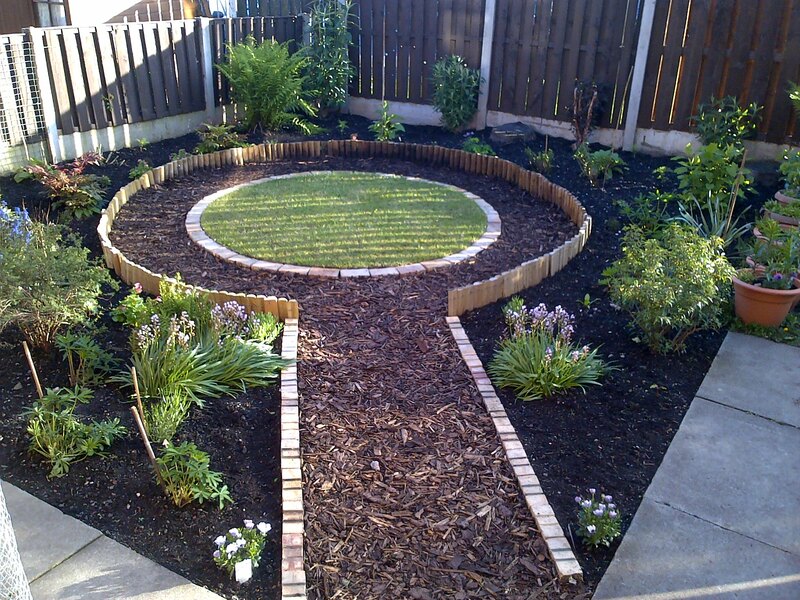 If you like gardening then you may like this! If you don’t then you’re best off watching the goat surf and giggling to yourself for a while instead (I managed 3 minutes before I got bored, let me know how long you last). This year I did a lot of work in the garden, I usually do something with the garden each year but this year I did quite a lot! In fact I managed to get it more like my original plans I created fifteen years ago (those old plans never came to fruition for a few reasons that I don’t need to go in to right now). 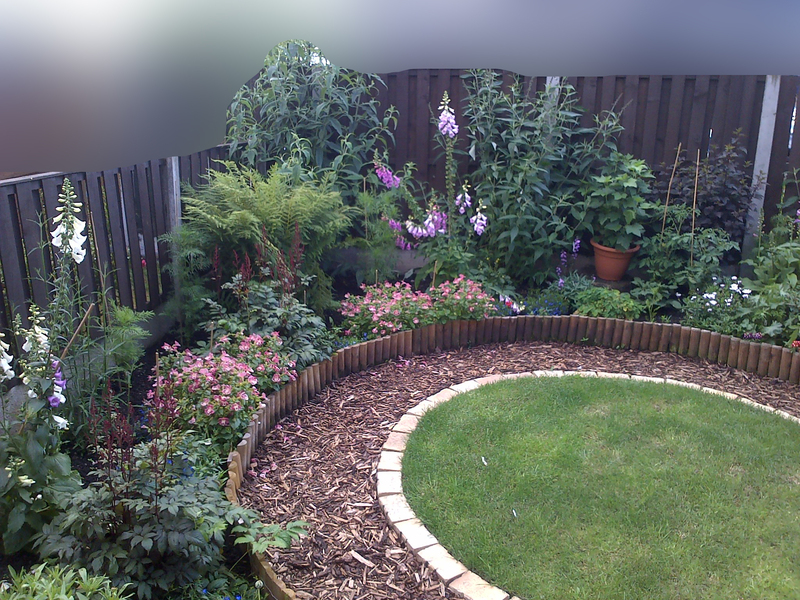 The first thing to note about the garden this year is that the two huge Leylandii trees were removed from the back of the garden, which gave us a lot more sun, space and water for the surrounding garden. Unfortunately the stumps and root systems were left in place! So me and my brother got to work to remove most of the root system, but will have to remove the full stumps in early 2016. 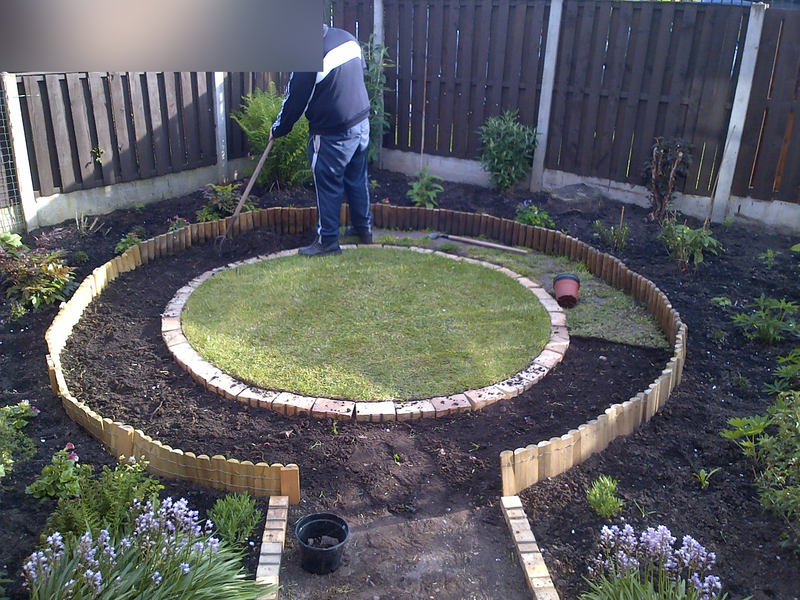 The first few pictures are of the garden in early April 2015 as it was after it was cleared the previous Autumn. I’d also like to apologise for the blurring out of certain things as I’ve had issues with morons on the net before and value my own and my family’s privacy and safety. In the above pic you can just see one of the tree stumps I mentioned earlier in the top right. 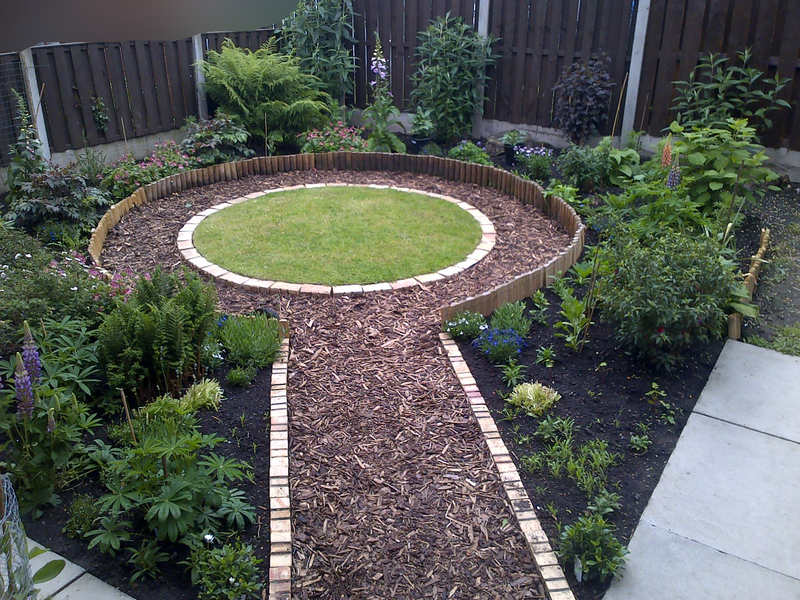 In the above picture you can just see the old hedge I planted, from the end paving flag at the middle bottom of the picture, moving it’s way to the left then around the edge of the path. We had to remove these as well as they were taking up far too much space. The point of the hedge was to be a wind break for the plants, but they stood up just fine when they were bunched together (well… most of them did anyway). The above picture is the position where most of the comparison pictures will be taken from. You can see (above) that there is a circle of greener grass in the center of the lawn, this was because I seeded it last year in preparation for putting a path around the edge which would be contained by log edging (pictured before it went in). I decided to move the path from left of the picture to the center and make it wider, which is marked by two orange bricks. 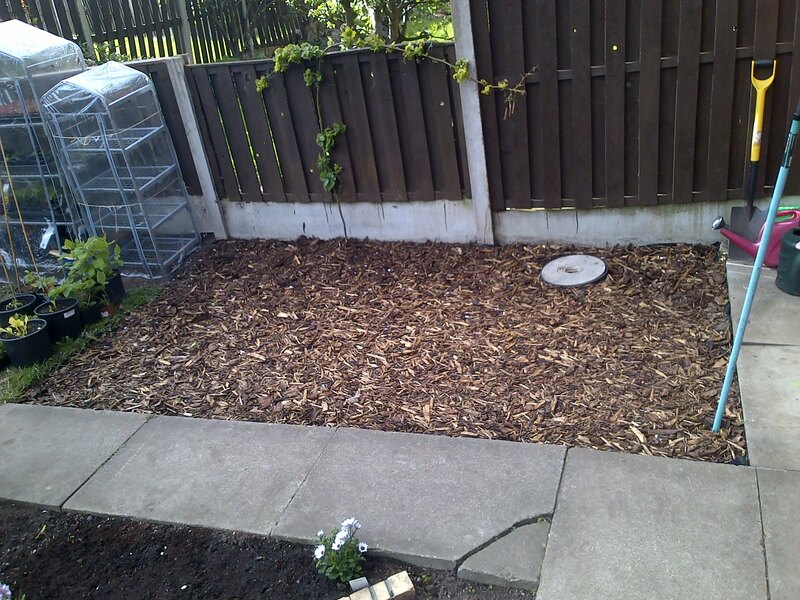 In the above picture you can see how much clearer and ordered the garden is. 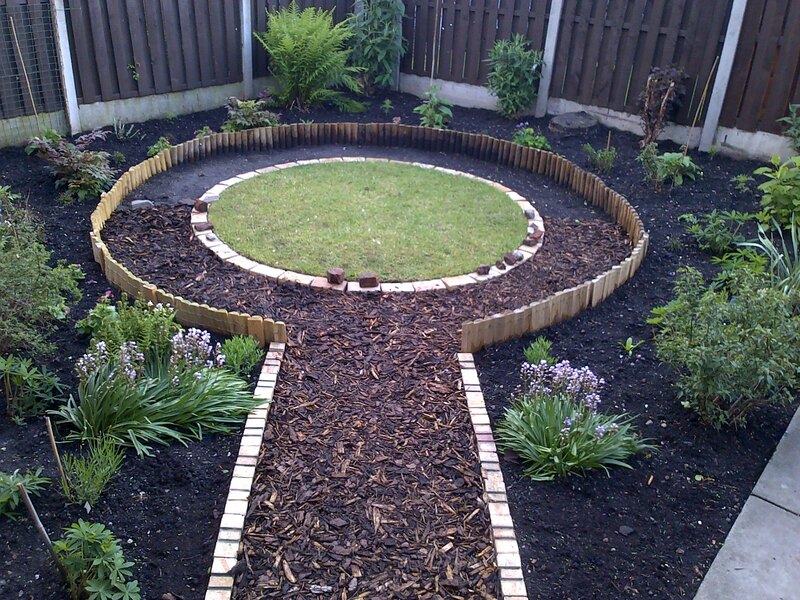 We created the new path and had to use a different log edging to finish the edge as the original large ones were not sold anymore. We had to make do with small ones and add steaks to them every 2 and half feet to enable us to sink them. 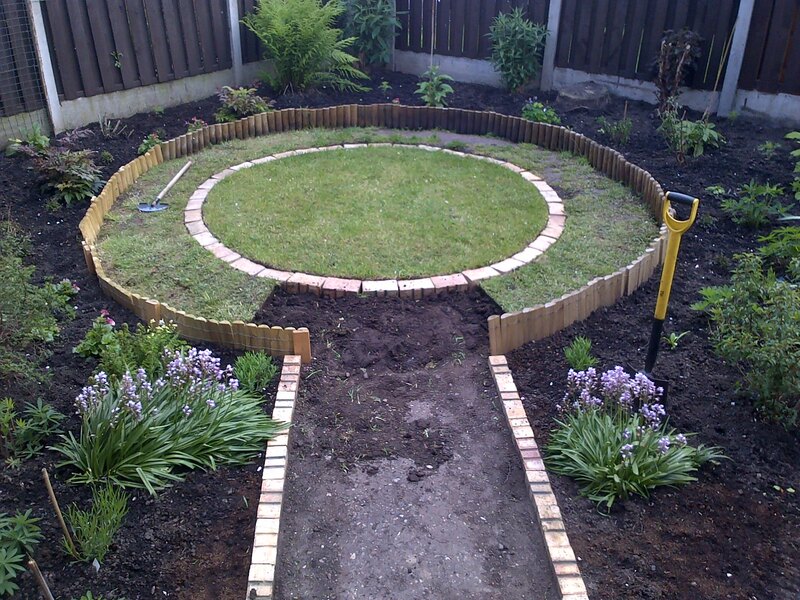 Next (above), I wanted to add an inner level circle of bricks (I had these left over from my old cold frame) flush with the grass for the inner edge of the path and to make it easier for mowing. This didn’t go very well but was rectified later on. A view from above shows how the inner circle was a bit ‘out’ at the 10:50 position if you look at the circle as clock with the path as 6. Also, look at the bluebells at the bottom left and right of the picture. Sadly they’re not English but invasive, but still beautiful! While that was being done we also decided to mend the fencing and give it a lick paint seeing as it hadn’t been done for a while (that’s my brother there painting away). It wasn’t really the weather for painting and I can remember it rained on us at least once, but it had to be done before all the plants were in place and growing. In the next few pictures below you can see the grass being removed, the ground being leveled, the brick circle being fixed and the chip-bark going down. 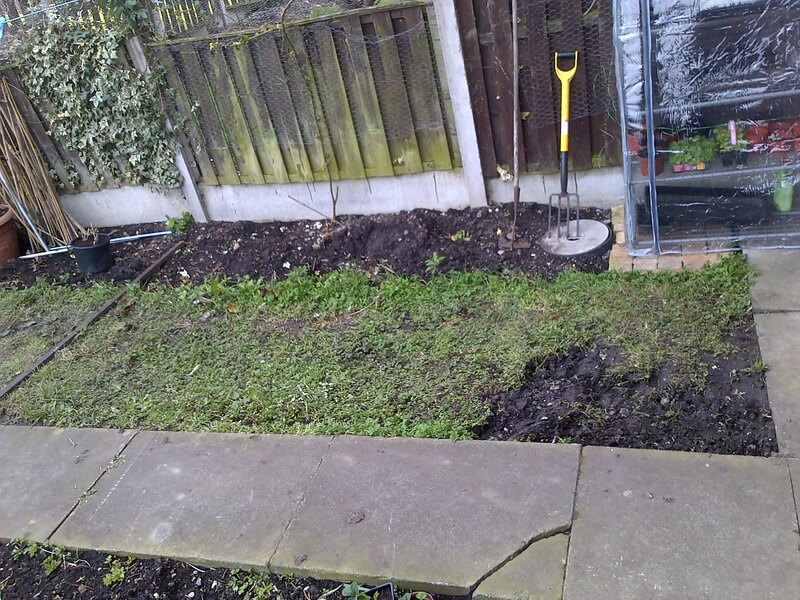 It doesn’t look like it (above) but a liner was laid before the chip-bark went down, I just laid it section by section as it was windy (the bricks were used to hold it down). There it is all done! You probably noticed that some plants were springing up too. Some of these were already there and some were added later on that were either grown by myself of came from the garden centre. Below there’s a picture of the garden a little further on with more plant growth. You can see on the left and almost top right there’s some Lupins, I grew these myself and was quite proud of them, until the giant aphids ate them! 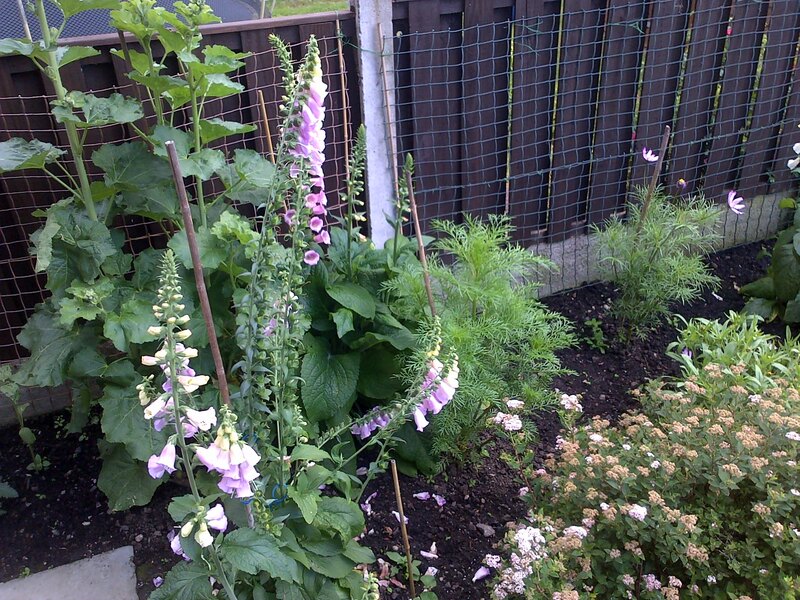 Something else I grew this year for the first time were Foxgloves (top center), although they are quite toxic I didn’t know how toxic they were. However I kept them on for that year and had no issues with them and neither did any of my Mam’s cats, and they also flowered right up until November! 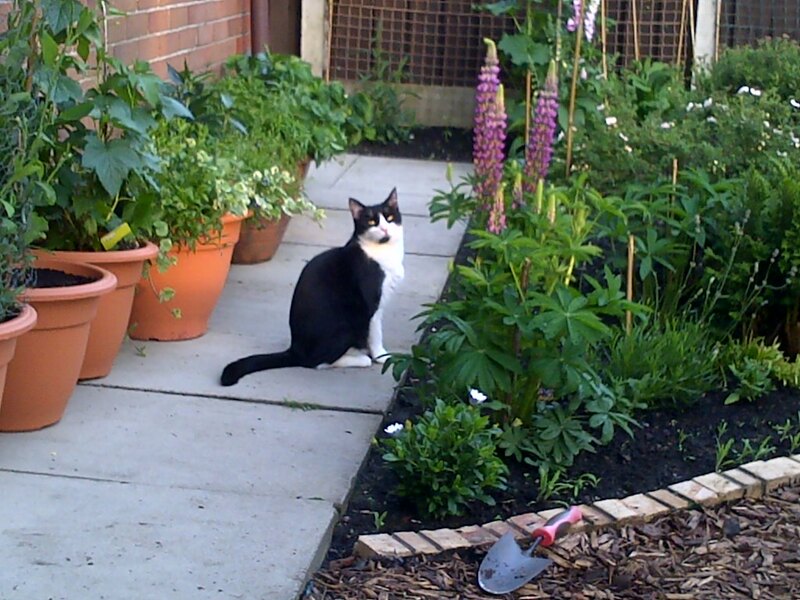 Here’s a better look at one of those Lupins with one of my Mam’s cats. I think he was contemplating attacking a Bee! The next lot of pictures (below) are panning from the left of the garden to right to give you a full view of the garden. 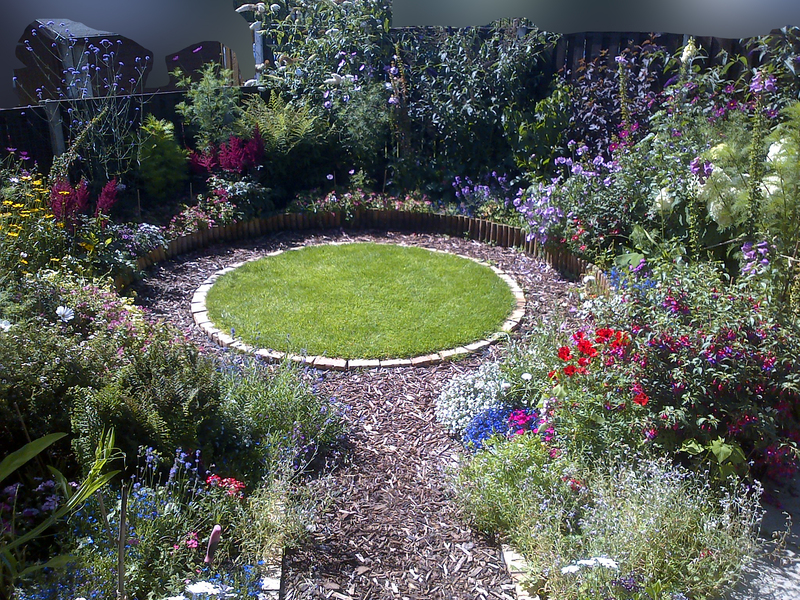 The final picture of the garden from that angle is it in full bloom at the height of Summer! Something else I finally did after all these years was create an area for the family to sit! It was supposed to be paved but seeing as I lacked the monetary funds and the skills to lay paving, I opted for something else. I first tried chip-bark but it didn’t feel or look right, so then ended up using gravel. Gravel wasn’t great but was better than the chip bark. 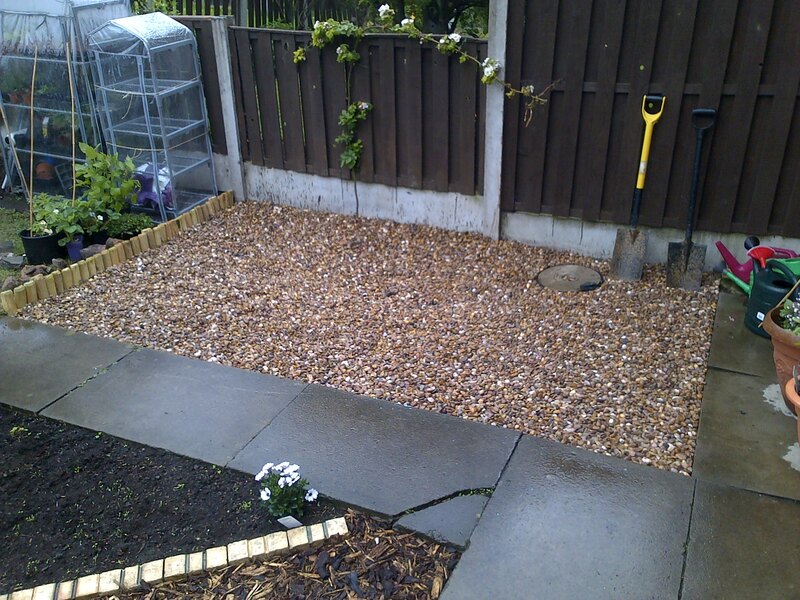 Next year the gravel will go around the path, as it was supposed to, and hopefully we can finally get a patio! The pictures below show this evolution. This is the area just when I started (above). The above picture was after and I wasn’t that fond of it. And there’s how it looks now. It isn’t great but it’s better than nothing! In fact I enjoyed myself out there last Summer, having a little drink and chat (obviously there was table and chairs then)! There you can see most of my planters. 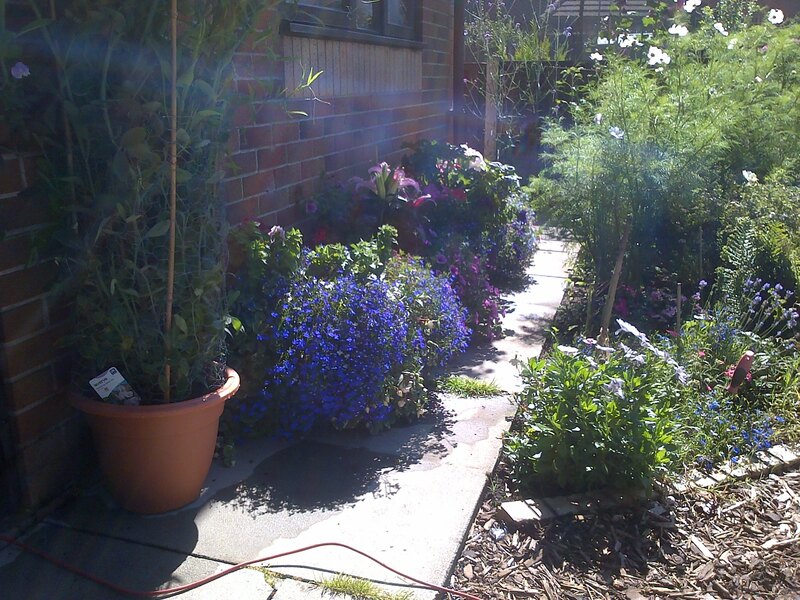 In fact the blue one closest to the camera is the planter I entered into a competition with my good friend Daf! This year we had a competition for the best planter, the award was bragging rights! The pictures are below, apparently it was a draw? Anyway that’s enough of that, I shall await Daf’s wrath! Oh, and I’ll be returning to some blogging soon and will visiting some pages too! It’s not like I’ve had nothing to say I’ve just been busy doing other stuff and generally got sick of politics and debating it. I just needed break from it I think. Until next time take care and all the best! This entry was posted on November 23, 2015 at 6:52 pm	and is filed under Hobbies. 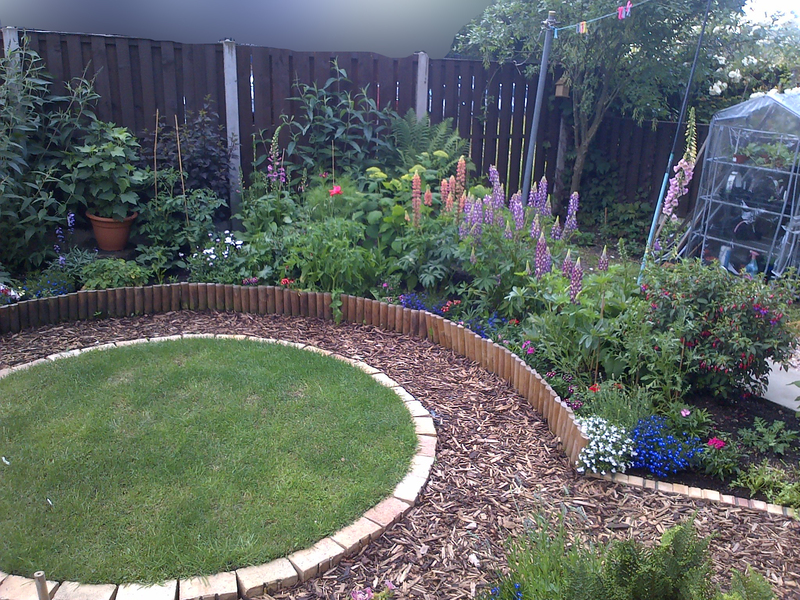 Tagged: Chip-bark, Design, English Garden, Foxgloves, Garden, Gravel, Hard Landscaping, Lupins, Planters, Urban. You can follow any responses to this entry through the RSS 2.0 feed. You can leave a response, or trackback from your own site. It’s a great excuse to be outside on days like that eh mate ? Indeed it is, budski! 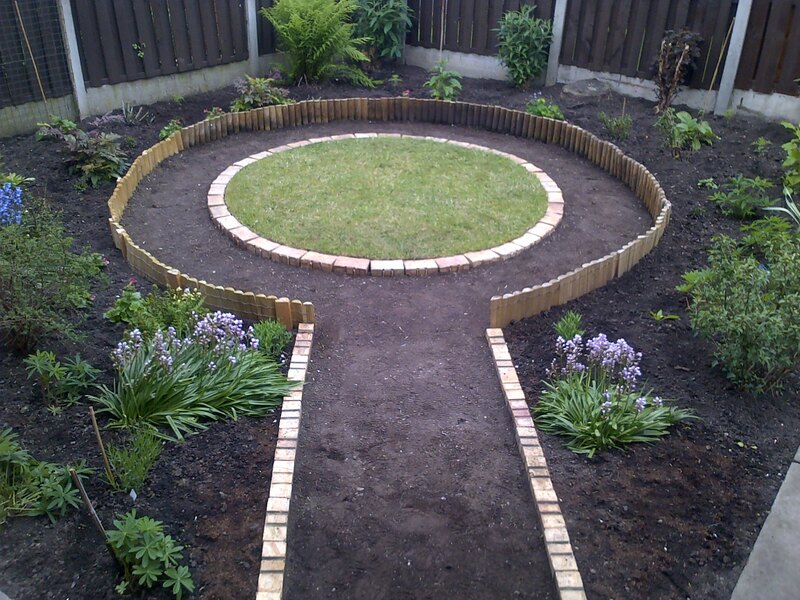 I find being outside in green spaces and working with my hands creatively can reduce my anxiety sometimes. So it’s a good place to escape to when I’m not too ill. Awesome work Phil! That is amazing! Two thumbs up! Long time no hear (mostly my fault for not being around :P). Thank you for your comment! I need to ask a question of ya! You obviously know of ‘Attack On Titan’? Well your site got me into that! 😀 And now I’m a fan of it! Was just wondering, does the live action film follow the events in the anime? It’s just I saw both parts 1 and 2 of the live action film and I saw who the intelligent huge and armored titans are! And I haven’t seen the 2nd series of the anime yet, I hope the film isn’t following the anime otherwise it’s spoiled it for me and many others! Merry Xmas to you too. I haven’t actually bothered watching the movies and the second season isn’t out yet. Perhaps someone who reads the manga would know in more detail but I wouldn’t count on the movie to spoil the anime. But I could be wrong. That would be so wrong in my opinion. Wow, Phil, what a job well done. The garden looks really lovely. How’ve you been doing with your gardening? I know you find it difficult with your health issues. If they are kept indoors, the water in the vase is also deadly and has been known to kill animals and children!!! Yeh, Foxgloves are a funny one! I knew they were toxic but not how much. Some people have such an acute reaction to them even the pollen can make them ill. I’m not like that and no one else in my family is so we’re good. My initial worry was that sometimes young kids are in my Mam’s garden as are her cats and other neighbours’, so could end up messing with them. That’s not really been the case but I don’t want to take that chance.